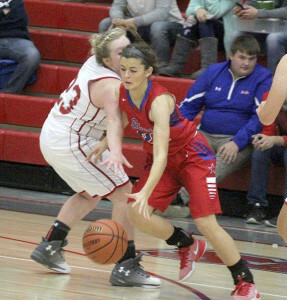 New Market — The Western Boone Lady Stars continued their impressive streak at the Sugar Creek Classic on Saturday night at Southmont. WeBo won the title with a 73-58 win over the host Mounties, the eighth-straight year the Stars have brought home the trophy. Western Boone head coach Rich Schelsky was pleased with how the team overcame some adversity in the championship game to win. Western Boone never trailed in the game. After leading by six at the end of a quarter, Western Boone led 20-13 with 6:03 left in the game and saw Sugar Creek Classic MVP Madison Jones go to the bench with three fouls 4:29 left in the half. The Mounties cut the lead to 20-19 and had numerous possessions to take the lead, but the Stars’ defense rose to the occasion. The Stars offense ended a four-minute scoring drought to create some distance and a 3-pointer by Olivia Hole at the first-half buzzer gave the Stars’ a 5-point lead at the break. Western Boone grabbed a firmer control on the game in the third quarter. The Stars got baskets from Kendra Nicley, Maddie Wright, Hole (3-pointer) and Jones in a 9-2 run to take a 38-26 with 5:40 left in the third quarter. The lead grew as high as 15 before a mini-Southmont run got them within eight at the end of the third. Western Boone was shooting better than 50 percent for most of the third quarter before missing their final three shots. Southmont hung around in the fourth quarter, but could never threaten the Stars. Leading by eight points with 2:58 to go, Western Boone went on 10-0 run to put the game out of reach. Oakley said the Stars’ offense was too good for the Mounties on Saturday. His team came into the game allowing just 39.2 points a game and had only allowed in the 50s twice. Western Boone placed two girls on the All-Tournament team — Jones and Hole. Jones scored 17 points on Saturday and averaged 15.5 points in the tournament. Schelsky said Saturday’s game was good for Jones and having to learn how she has to play with foul trouble. Hole scored 16 points, including 12 in the second half. She added a team-high 8 rebounds. Schelsky said Hole was deserving, but noted she wasn’t the only one. Nicley co-led the team in scoring with 17 on Saturday and Wright added 11. Callie Gubera scored nine points. Southmont was represented on the all-tournament team by Kasey Burton, who scored a game-high 19 points and pulled down 17 rebounds before fouling out. Schelsky said after the game that he was impressed with Burton. Case added 17 points and eight rebounds, while Avery Hess had 11 points and four rebounds. Western Boone travels to Westfield on Tuesday. Schelsky said the Stars have to learn from the past week’s games.